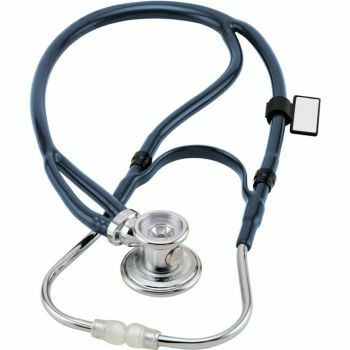 The Deluxe Sprague Rappaport X Stethoscope with X-Configuration dual-lumen acoustic tubing is the most advanced Sprague Rappaport used by healthcare professionals. Similar to the Sprage Rappaport, it is five stethoscopes in one for a full range of diagnostic applications and is traditionally trusted to detect faint heart sounds and murmurs. The innovative, patented X-configuration tubing eliminates the rubbing of traditional Sprague Rappaport dual tubing that can cause acoustic interference. Healthcare professionals can assess adult, pediatric, and infant patients using the classic, versatile design. The handcrafted zinc-alloy dual-head convertible chestpiece is precisely machined for high performance and durability. Full-rotation dual-output acoustic valve stem with green indicator dot allows the user to easily identify te active sound channel. Using the included accessory kit, the adult and pediatric diaphragm assemblies can be removed and replaced with adult, pediatric, and infant bells. Adjustable headset constructed from chrome-plated brass allows the user to create an individualized fit. Soft silicone ComfortSeal eartips are clear for hygienic purposes and conform to the ear to seal out extraneous noise while ensuring comfort during extended use. Patented SafetyLock eartip adapters lead the industry in user safety.